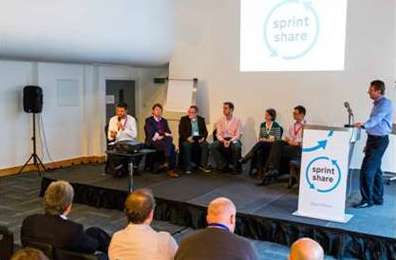 Following on from July’s SPRINT Alpha (which celebrated the best in digital and showcased the work being done around the UK to make services digital by default) this month’s Sprint Share event promised knowledge sharing and networking by bringing people together working on the digital exemplars. Having worked on the View Driving Record Service as a User Tester for 10 months this seemed too good an opportunity to miss. With no persuasion needed, my colleagues and I attended the event in Birmingham and, although this was the first time for many of us to meet colleagues from across the exemplars at such a large gathering, we were keen to experience an event which focused on us, the people actually making the transformation of our services to digital. Following a shaky journey (some of us aren’t used to driving an automatic car!) and a quick coffee stop en-route, we arrived full of enthusiasm. The moment we walked through the door we were instantly engulfed by the buzz that seemed to sweep through the crowd. To be in the middle of such a large gathering that was full of people with positivity and passion for what they do is a feeling that can’t really be described. As we all made our way through the crowds offering our own introductions we all immediately got stuck in. Well, I say all. Our Service Manager, Rohan Gye, had his own idea, mainly making a bee-line for the camera and being interviewed before the rest of us had even checked in our coats! Still, you can’t beat a bit of product endorsement! The day’s agenda promised to be based ‘on the things you’ve told us you want to talk about’ and with plenty of time and opportunities to network and dig beneath the issues that really matter, a wealth of information, advice and guidance awaited each and every one of us. It also seemed to make the whole ‘Digital by Default’ plan real and showed that we are working with real people, people that do what we do every day and who have the same drive and passion that we do to make our end product a success. With the day’s agenda now explained those that had already had their Beta go Live were asked to stand up, just to show that they had ‘done it’. Whilst it was refreshing to see so many services already rolled out to the public I couldn’t help feeling envious of them. I wanted to do that, I wanted to show that our service had gone live and I decided there and then that, by the next event, I would be one of those people asked to stand, showing that we too have done what we set out to do. After a quick break we separated in to smaller workshops that each individual had selected prior to attending. Some of the cross programme topics discussed included governance, user research, organisational structure and digital transformation across the civil service. Both Paul and I opted for the ‘Digital transformation and the wider civil service’ workshop to gain a better understanding of, not only how digital is changing across the Government, but the positives and negatives that have been brought to light. Two quick-time presentations from HMRC & DVLA kick-started our workshop and both provided enough ‘food-for-thought’ for us all. A quick session followed where we each had the opportunity to discuss something that people don’t usually like admitting: the obstacles we’ve all faced. No project is without its stumbling blocks and it was refreshing to hear the accounts of others and how they overcame them (we managed to pick up a few tips along the way too!). Simply by listening to a small group it showed that I wasn’t the only one who wanted feedback that I could take away and incorporate in to our project. Next it was on to lunch and yet another chance to network. As well as meeting such a vast array of people from so many other governmental departments it was a perfect chance to ask and answer so many questions. I could see how much everyone was delivering, seeing the enthusiasm in their faces as they spoke of the progress of their project and it hit home how we are indeed moving from old to new across government. With our stomachs lined and our mindsets refreshed it was time to move on to a Q&A session with the Service Managers who were in attendance. Questions were thrown left right and centre and each answer helped and clarified so much for us all. The enthusiasm for the topics was maintained throughout the session and we were even let in to an unknown secret: Service Managers are, in fact Super heroes (who’d have guessed?!) Well what does that make the team? Possibly the highlight of the day for me came right at the very end from HMRC’s new Chief Digital and Information Officer, Mark Dearnley. His closing presentation provided an enlightening insight in to the challenges such a large organisation faced when changing its whole legacy I.T. system. This struck a chord with so many of us from DVLA as we too are in the process of ‘modernising’ our Legacy systems and displayed that there is light at (what sometimes feels like a very) long tunnel!. So, if you’re ever offered the opportunity to attend an event such as this then please, take it! The personal benefit to every individual is huge and, the more you learn the more you can share! Great post Sarah, and you're so right - it's important to be around other peeps you do to work with every day to share experiences. So glad you got so much out of it! Great summary of the day. I too found it useful and took away so many pointers that have already helped my team. Interesting paragraph about the legacy system too and I agree, it does feel like any endless journey to make the switch! 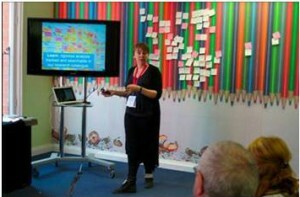 What a good blog Sarah, you've managed to capture the benefits of knowledge sharing brilliantly. Events like this are indeed an excellent opportunity to pick up all sorts of useful information and I would also like to thank you for the advice you gave me, it has actually been a big help.